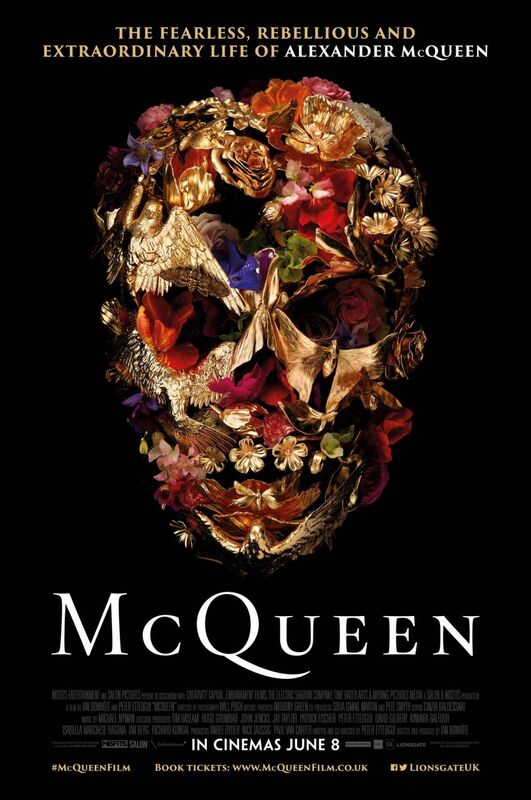 Poster for Ian Bonhôte and Peter Ettedgui’s McQueen (2018) Vanitas Skull by Gary James McQueen. Photo: Dan Tobin Smith ©Lionsgate. Alexander McQueen would have been 50 today. As many of you know, I started this blog with posts on Alexander McQueen, as a way to commemorate his work. His birthday is a natural time to revisit and reflect on his legacy. Since my last roundup in 2015, for the London version of Savage Beauty, I’ve posted about the designer’s 1998 Blade Runner collection. You’ll also find extensive updates to my inaugural McQueen for Givenchy series: as part of my recent blog redesign, I added additional and improved images from runway, advertising, and editorial. Esther de Jong in Chanel haute couture by Karl Lagerfeld, Fall 1997. Photo: Karl Lagerfeld. Image: jalougallery. Farewell to Karl Lagerfeld. Prolific, influential, and above all, iconic, the designer — who had a lifetime contract with Chanel — was working to the last. Google doodle celebrating Eiko Ishioka, 2017. Image: Google. 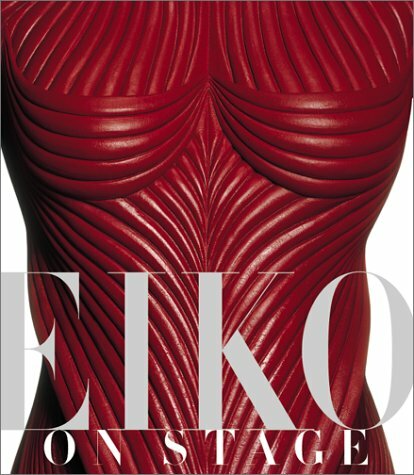 In memory of Eiko Ishioka, who would have been 80 this year, a look at costume patterns based on her work. Eiko on Stage (Callaway, 2000) Image: abebooks. Eiko Ishioka (1938-2012) is best known as the costume designer for The Cell and Bram Stoker’s Dracula, for which she won an Academy Award in 1993. Her last film project was Tarsem Singh’s Mirror Mirror, starring Julia Roberts and Lily Collins. 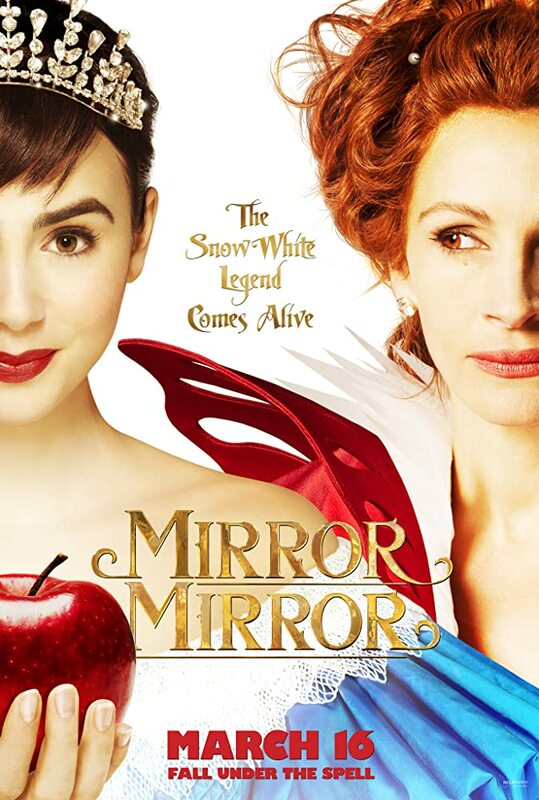 Poster for Mirror, Mirror (2012). Image: IMdB. McCall’s 6629 / 240 (2012) Image: Etsy. The Queen (Julia Roberts) and Brighton (Nathan Lane) in Mirror Mirror (2012). Photo: Jan Thijs ©Snow White Productions, 2011. The gown features white peacock embroidery and a molded basque with four-piece cups. 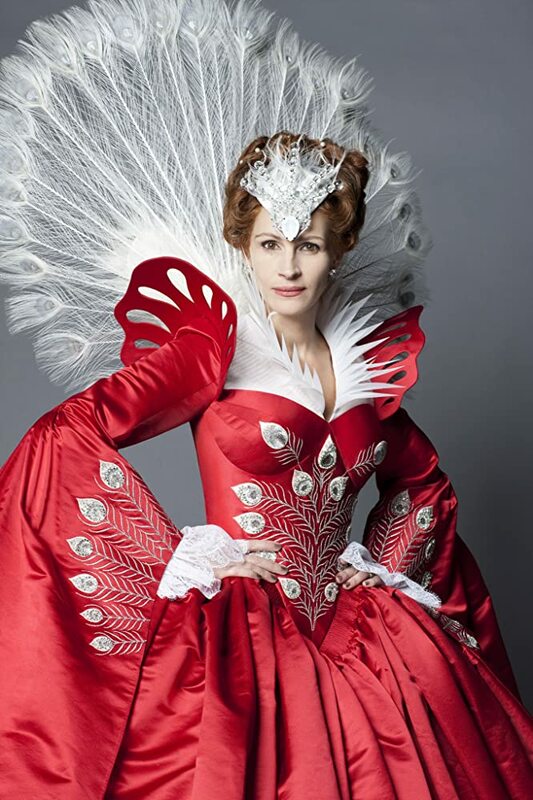 Julia Roberts as the Queen in Mirror Mirror. Image ©Snow White Productions, 2011. 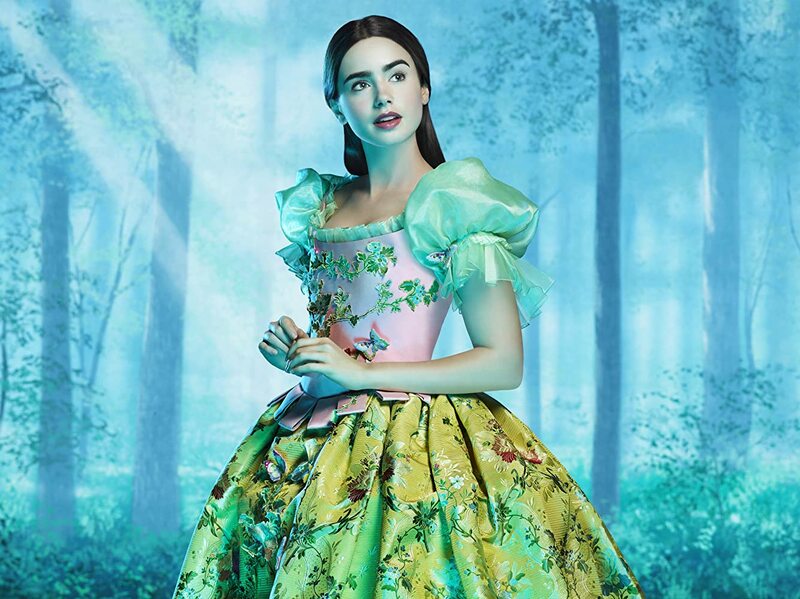 View B (top right) is clearly Lily Collins’ Snow White, but so is view A. It’s the dress with floral basque and skirt, seen early in the film, which Ishioka topped with one of the most memorable capes in cinema. 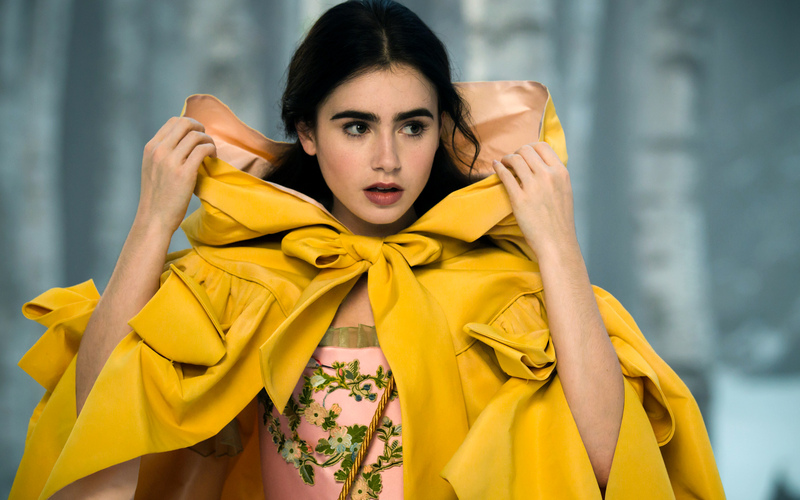 Snow White (Lily Collins) in Mirror Mirror (2012). Image ©Relativity Media, 2011. Lily Collins in Mirror Mirror (2012). Image ©Relativity Media / Richard Crouse. Simplicity also offered Snow White’s dress from the film’s Bollywood finale, moving the giant bow down from the shoulders. Simplicity 1728 (2012) Image: eBay. 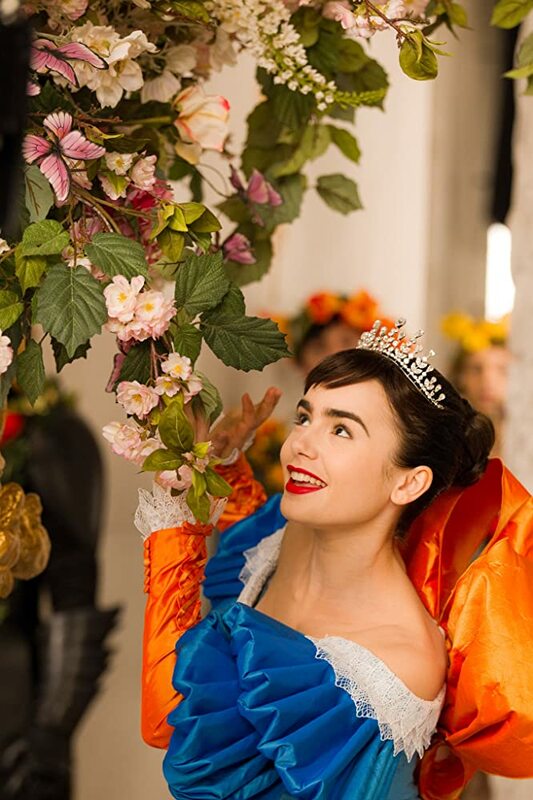 Snow White (Lily Collins) in Mirror Mirror (2012). Photo: Jan Thijs ©Relativity Media. 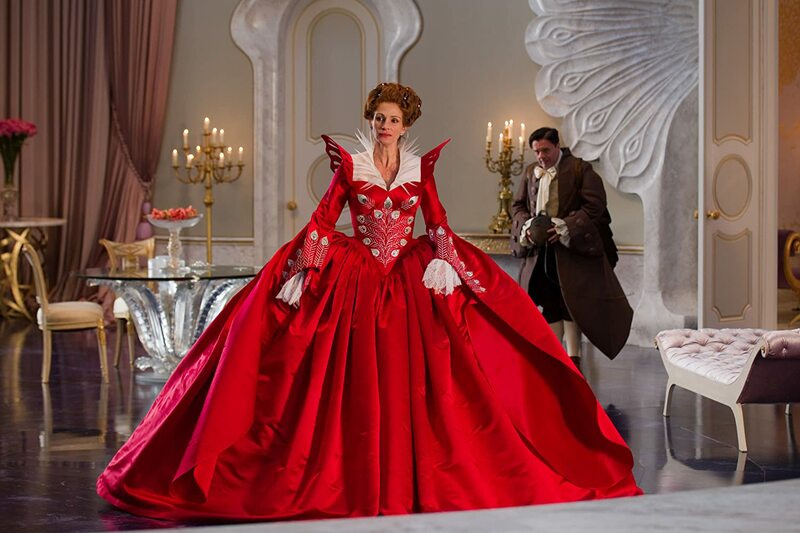 The Costume Designers’ Guild gave Ishioka a posthumous award for Mirror Mirror. (For more on the production, see Wired.) And since her on-screen version, all yellow capes seem to point back to Snow White’s. Claire (Caitriona Balfe) in Outlander, season 2 (2016). Image: Starz / Life According to Jamie. Alberta Ferretti coat, Fall 2017. Images: Moda Operandi. Jordan Prentice, Joey Gnoffo, Sebastian Saraceno, Lily Collins, Martin Klebba, Mark Povinelli, Ronald Lee Clark, and Danny Woodburn in Mirror Mirror (2012). Photo: Matthew Rolston ©Relativity Media 2011. 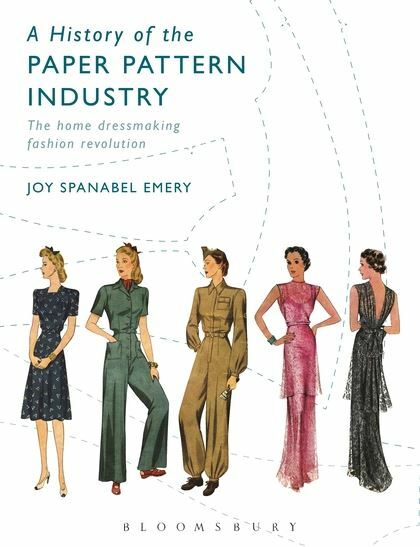 A History of the Paper Pattern Industry, by Joy Spanabel Emery. Image: Bloomsbury. Joy Emery, Professor Emerita of the University of Rhode Island and curator of the Commercial Pattern Archive, has died. She was 81. 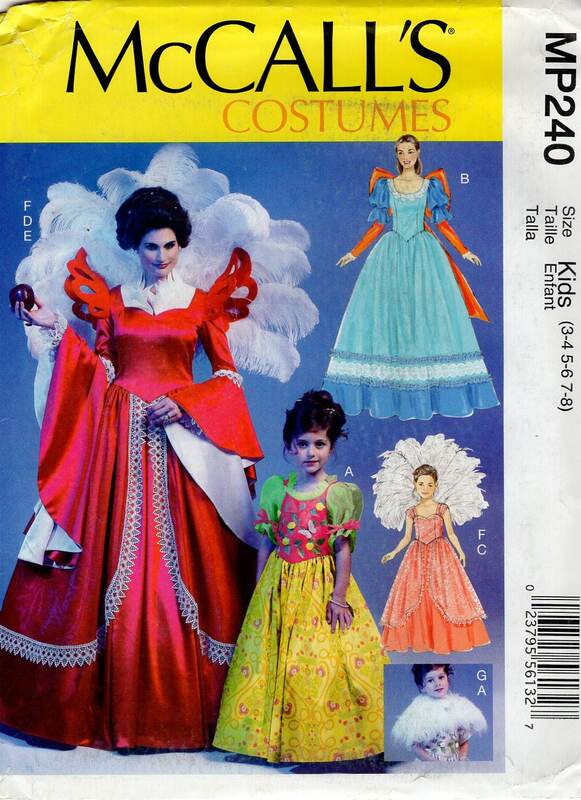 Emery is the author of Stage Costume Techniques (Prentice-Hall, 1981) and A History of the Paper Pattern Industry (Bloomsbury, 2014), which I reviewed for this blog. Memorial donations may be made to the Joy Spanabel Emery Endowment Fund. Read her obituary, or a 2016 URI profile upon winning USITT’s Distinguished Achievement Award in Costume Design and Technology. Pertegaz (Centro de Arte Reina Sofía, 2004) Model: Laura Ponte. Photo: Antoni Bernad. Image: The Cary Collection. Manuel Pertegaz was born on this day in 1918. Paco Peralta asked me to contribute to his post for the designer’s centenary; see it here. Suzy Parker wearing a coat by Pertegaz, Vogue, March 15, 1954. Photo: Henry Clarke. Image: Condé Nast. 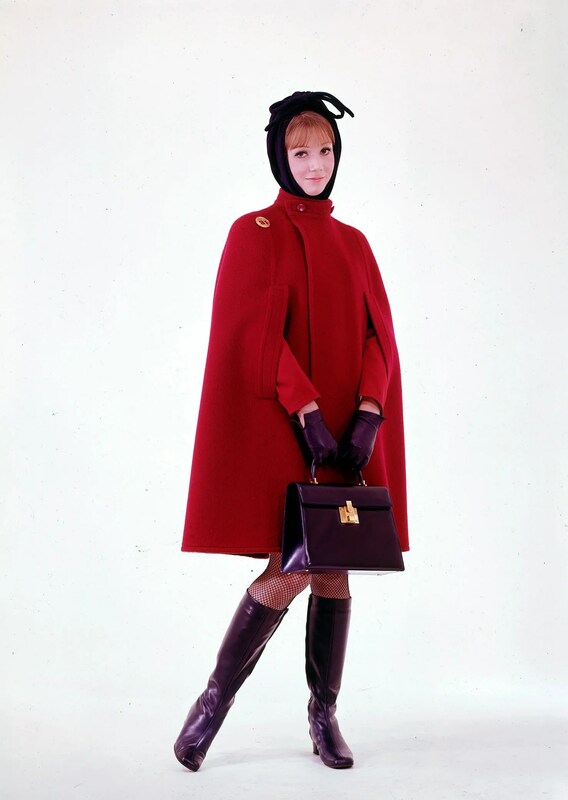 Rosa Real, made-to-measure Iberia flight uniform by Manuel Pertegaz, 1968. Image: Iberia. 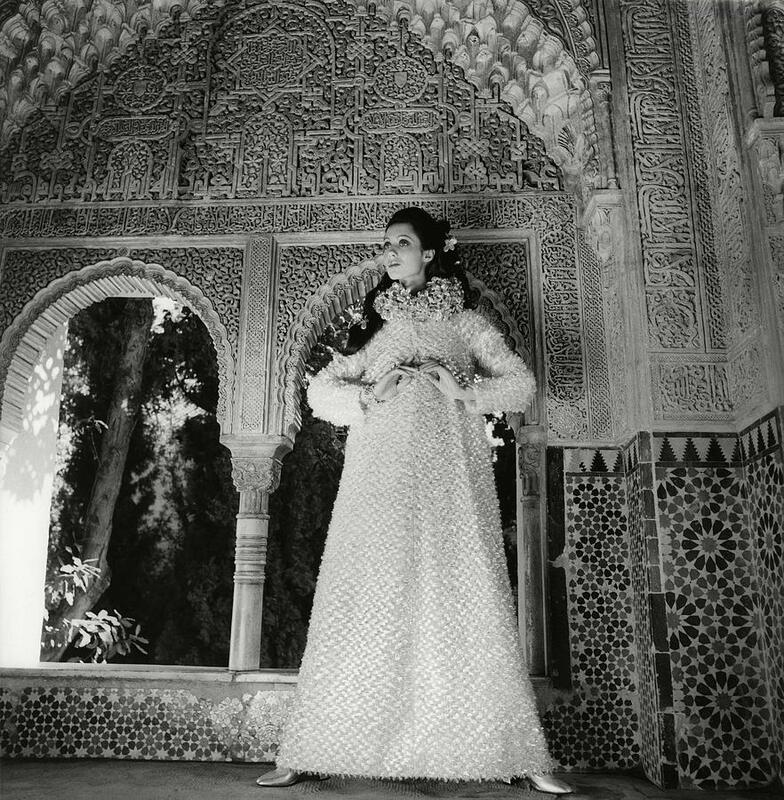 Moyra Swan wears a Pertegaz caftan gown in the Alhambra, Vogue, October, 1968. Photo: Henry Clarke. Image: Condé Nast. Shalom Harlow in a gown from Hubert de Givenchy’s final couture collection, British Vogue, October 1995. Photo: Nick Knight. Editor: Lucinda Chambers. Image: TFS. Farewell to Hubert de Givenchy, truly one of the greats. 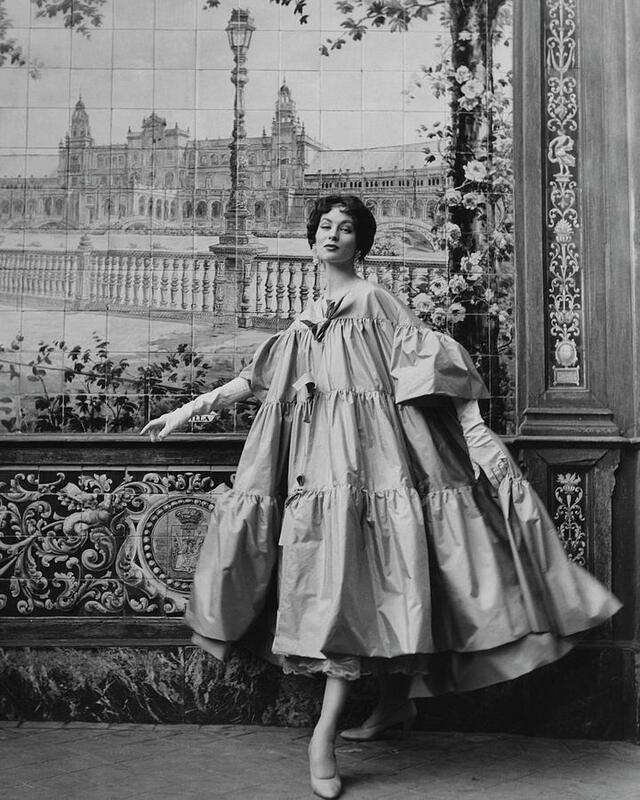 Read the couturier’s Vogue Paris obituary.